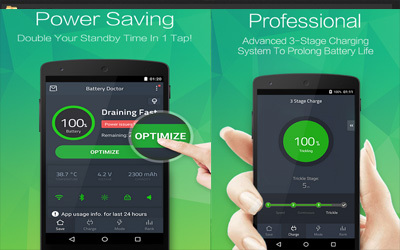 If you feel that your phone battery is draining so quickly, you have to try Battery Doctor APK 5.29. This is an app that will be functioned as the battery saver. This app is using the special system management that can reduce the battery consumption for your phone. The interesting part about the use of this app is that you will be able to save your battery up to 50%. It is very valuable especially for some type of smartphone that has a very small sized battery inside. This app will work well in finding the app that is useless, pause it than the app will not consume battery power. Some other interesting aspects are also added by the developer for this app. It can be seen by the presence of 3 stage charging system. So it means that the app does not only press the consumption. It will also raise and redefine the power of phone charging system as well. Add shortcuts to access functions on Charge Master. Add “Overcharging Reminder” to let you feel more relieved.